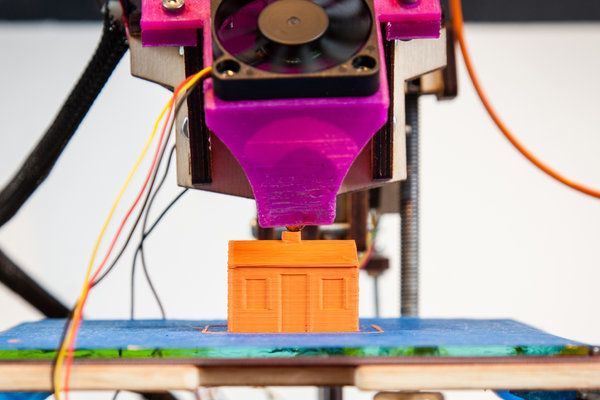 Great piece responding to the State of the Union mention of 3D printers in the New York Times! When Brook Drumm saw clips from the speech at his home outside Sacramento, Calif., he wanted to reach through his TV and give the president a fist bump. Mr. Drumm, a bald, goateed father of three, designed the Printrbot, a desktop 3-D printer kit. Like a number of other 3-D printers, it uses heated plastic — applied layer by layer to a heated bed by a glue-gun-like extruder — to turn designs created on a computer into real objects. Like computers, 3-D printers originally proved their worth in the business sector, cost a fortune and were bulkier than a Kelvinator. But in the last few years, less expensive desktop models have emerged, and futurists and 3-D printing hobbyists are now envisioning a world in which someone has an idea for a work-saving tool — or breaks the hour hand on their kitchen clock or loses the cap to the shampoo bottle — and simply prints the invention or the replacement part….